Welcome to our home on the web. We are Matt & Shana Bobbitt of WA state. 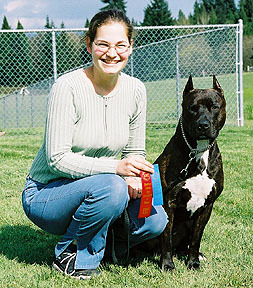 I (Shana) was introduced to the American Pit Bull Terrier in 1996, and started showing with the United Kennel Club in 1997. The acquistion of "Buddy" in 1998 started my "title-earning" quest when he rocketed to his Championship in quick fashion. 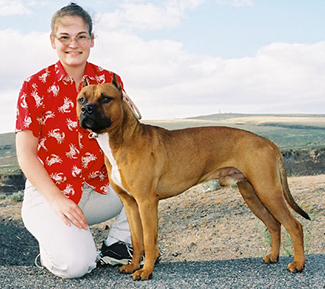 He has since become the 10th dog in UKC to earn titles in four areas (conformation, obedience, agility & weight pull). My great-grandmother raised Boston Terriers and I always had fond memories of them as a child, so with the purchse of my first home in 2001, a Boston was also added to the mix. "Missy" has been a fantastic companion and hopefully will also be a Super Dog soon. Our APBT's are UKC registered and Purple Ribbon Bred. Our Boston Terriers are dual AKC and UKC registered. We subscribe to the Breeders Code of Ethics. Our dogs are bred for excellence in conformation and temperment, as well as companionship, with special focus on the health and preservation of the breed. We believe in the "Total Dog" and compete in conformation, obedience, weight pull, and agility. We hope that you will take a moment and look around the site. Shana with Buddy, new UCD! 3/20/18 All my dogs have passed on now and I am not currently involved with any events.